Incident locations (address & any other location data; preferably, latitude and longitude). Causes of ignition of fires; heat sources; areas of origin. Mortality rates (fire-related; trauma; other medically-related). EMS mechanisms of injury and causes of illness; and EMS provider “impressions” (i.e., diagnosis). Response times of all units involved (“fractile” method; not averages). Rate of dollar loss to value. You may want to obtain more or less data elements than the ones above. However, at the least, you will want to collect incident dates, times, types and locations in order to get a minimal perspective of what is occurring within your service area. Many fire departments now document their emergency incidents electronically using computerized records management systems (RMS). Most commercially available applications have been designed to collect incident data based on the National Fire Incident Reporting System (NFIRS). The United States Fire Administration (USFA) began the NFIRS in 1975. Under this program, local fire departments submit their data to a state organization who, in turn, reports this to the USFA. If your incident data is not easily accessible locally, you may be able to obtain the information from your state, or obtain an account with the USFA, which will allow you to acquire specific reports. Depending on the type of RMS you have, your system should be able to generate printed reports or export summary information in the form of a database or spreadsheet. You should acquire a minimum of 3–5 years of data (more, if in a very small, low-volume community), so as to ensure you have enough information to provide an adequate perspective of what is occurring. 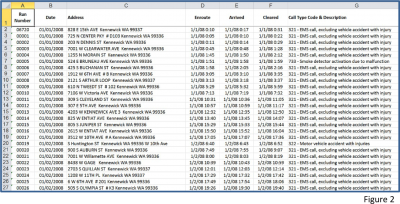 Figure 2 is an example of a partial section of a spreadsheet containing fire department incident data. Depending on the type of RMS your organization uses, and the extent of the information collected and entered into it, you will need to determine what data elements to extract (or what reports to generate). In most communities throughout the U.S., the local public safety answering point (PSAP) and/or dispatch center collects valuable data through complex and sophisticated computer-aided dispatch (CAD) systems. Although the information collected varies among systems, the data typically includes: incident locations; dates; apparatus dispatch and arrival times; incident type; and much more. Often, CAD data is downloaded or integrated into the fire department’s RMS. In that case, the necessary data may already be in your RMS. If not, most CAD systems can export incident records to a spreadsheet or other format to enable data analysis. The National EMS Information System (NEMSIS) Project is an effort to create a national emergency medical services (EMS) database. The current NEMSIS NHTSA Version 3 Dataset defines over 500 standardized data elements that can be collected. Most state EMS agencies are participating to some degree in collecting EMS incident data from local agencies. If your agency submits electronic EMS data to your state EMS office, you may be able to obtain reports or electronic data from them. You may also request local EMS data (with some limitations) from NEMSIS (www.nemsis.org). Law enforcement agencies (local, state, and federal) have a long history of collecting and maintaining incident records and other information. These records may include arson reports and drug-related incidents, assaults, and other information that can ultimately impact the fire department. The Federal Emergency Management Agency (FEMA) (www.fema.gov)and Department of Homeland Security (DHS) (www.dhs.gov) websites contain substantial information that can be useful in risk assessment—particularly in natural and human-caused disasters. The National Weather Service (www.weather.gov) can also serve as a source of information on weather-related events. The Centers for Disease Control & Prevention (CDC) website is another excellent source for health and injury-related sources and materials. Located on their website is the Web-based Injury Statistics Query and Reporting System (WISQARS™). It is an interactive database system that provides customized reports of injury-related data. Firefighter experience can be a valuable source of information. They can be utilized to conduct station-based risk assessment and pre-planning. Information from these activities should be documented and recorded (preferably in an electronic database format).